This weeks draw for Swinford GAA 50/50 draw was held in Sheepwalk on 7th July and Ruadhan Lyne & Rachel Halligan c/o Fiona Murtagh Halligan won €835. Envelopes are available in most business premises and online through www.swinfordgaa.ie where tickets can be purchased in bundles of 10/25/52 weeks. Next draw in Horkans on 14th July. Draw envelopes are now also available at 3 for €5. Any member who requires tickets for the Connacht Final please contact a Club officer by Saturday 11th July. We have a very important league game this Saturday away to Bonniconlon. We are currently lying second in the table behind Islandeady who this weekend face away game to The Neale. Game is at 6-30pm in Bonniconlon. 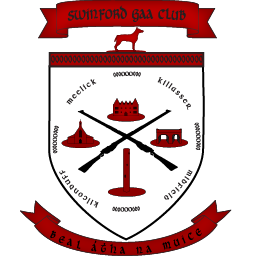 Swinford GAA have entered into an arrangement with the Vodafone shop on Market Street where you will earn points on certain transactions which will turn into sponsorship for the club when we reach 700 points. When you are shopping within the store please mention Swinford GAA when you are paying. The minor game away to Kiltimagh has been rescheduled for Monday 13th July at 7pm.